HAUMEA, the Hawaiian goddess of fertility and childbirth, has given her name to a distant dwarf planet beyond Pluto, discovered in 2003. It has two moons, named for two of her daughters—sea goddess Namaka, and Hi’iaka, goddess of the hula dance. Another of her daughters is Pele, the volcanic fire goddess. 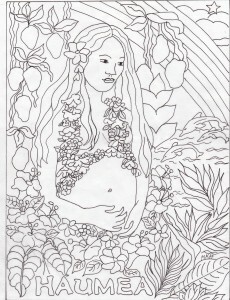 Mother of all creatures, Haumea is ever pregnant, taking time to renew herself after each birth. She reminds us to give pause and honor every creation as it is born, so that it finds its true relationship to the greater whole. Now in Libra, a sign of relationship and balance, Haumea seeks to realign the balance in relationships between people, nations, religions and humanity with Earth. Where is she in your chart? Clearly we need her presence to soothe the extreme polarization currently rampant and disruptive, as we collectively give birth to a new level of global consciousness and cooperation. So many of the new distant planetoids are being named for indigenous creator gods and goddesses. How hopeful! Contributions to Cosmic News are very welcome. I appreciate the support and feedback I receive from new and longtime readers, and the personal notes.